To bring home to you that our collective unconscious has some serious work to do to become more of a compassionate conscience, allow me to tell you a story that happened recently across the street from my home. Every year my town of Chadds Ford has a community fair to commemorate the Battle of the Brandywine which occurred on September 11, 1777. 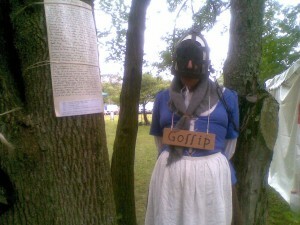 A man dressed as a woman in colonial garb being punished for being a “gossip”. Photo taken by the author. Mind you, this punishment was meant for women who “scolded” or “gossiped”—that is, spoke out in any way in a society in which they had no say. Historians remind us that colonial women had no legal rights as individuals. Judge and jury were all men. What may be one man’s being scolded, may be a woman’s speaking her truth. Would that I could now say that the re-enactment of the so-called town gossip stood to remind us of how far we have come from such degrading, humiliating, and cruel treatment of another human being. Unfortunately, the re-enactor’s silent stance appears to have become a symbol for some men to long for the “good old days.” I was appalled to overhear (ooh, am I gossiping?) one man (who looked, for all intents and purposes, like a regular family man) wax on with some men behind a food counter, “Hey, did you see the guy dressed as a woman gossip?” His words were something to the effect of that’s appropriate punishment for a woman. The dominator [patriarchy] model in relating to women leads to and is based on misogyny. In our society there is a philosophical reverence toward motherhood but often a hatred of actual women. There are people who love the Madonna but are not kind to the women in their lives. It is up to each of us to examine our conscience and confront these contradictions. They usually have roots in our original relationship to our own mothers and require therapy to resolve. Quiet Wisdom in Loud Times Copyright © 2014 by Kayta Curzie Gajdos, Ph.D.. All Rights Reserved.